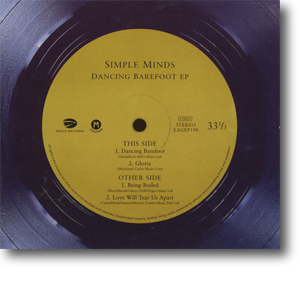 The Dancing Barefoot EP was the start of the campaign to gradually reintroduce Simple Minds and slowly build the band's profile. Therefore Eagle Records (the Mind’s new record company) weren’t anxious for a huge hit immediately and were content with some initial low-key releases. The original plan was to limit the single to 2000 copies worldwide. In the end, 20,000 copies were manufactured (with 10,000 being sold alone and a further 10,000 included in the Neon Lights limited edition set). As a thank you to fans, Eagle spared no expense, pressing up the EP as black CD to resemble a 7” record. The digipak artwork continued this idea, being a reproduction of a 7" label. The single was primarily an introduction to Neon Lights with Dancing Barefoot and Gloria taken straight from the album. Being Boiled and Love Will Tear Us Apart were recorded during the same sessions, and included as exclusive bonuses. The Dancing Barefoot EP wasn’t legible for chart listing. One-track promos issued before the single were simple CDRs with black typed labels in custom card printed sleeves. This set the pattern for all future Eagle single releases. 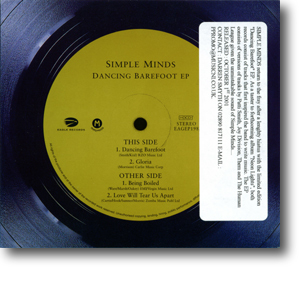 Some commerical copies of the singles were also used as promos. These featured press release stickers. The US promo was much more extravagant featuring new custom artwork and a colour printed CD. Unfortunately no associated commercial single ever appeared, but the two bonus tracks were included on the US version of the album.